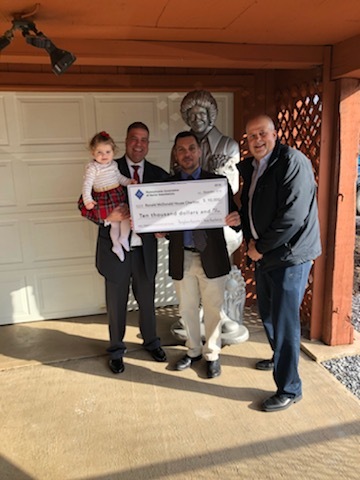 Courtesy photo At a recent check presentation in Hollidaysburg were (from left): Jason Bauer, board member of the Pennsylvania Association of Nurse Anesthetists, and his daughter, Claire; Darin Tornatore, president of the Ronald McDonald House Charities Mid-Penn Region; and Marty Stern, treasurer of the Mid-Penn Region. HOLLIDAYSBURG — The Pennsylvania Association of Nurse Anesthetists (PANA) has donated $10,000 to Ronald McDonald House Charities (RMHC) in Pennsylvania to help families with housing near a hospitalized child. The grant supports each of the houses in Danville, Hershey, Pittsburgh and Scranton and both houses in Philadelphia. Helping a sick child fight their illness takes a big enough emotional toll on a family. Adding a financial strain can make it almost too much to bear. Ronald McDonald House Charities helps to address those problems, whether they involve housing that’s near a hospitalized child, the expense of staying together in another city, or even getting basic medical and dental care in a vulnerable community. PANA’s $10,000 grant covered roughly three nights at each location — one each in Danville, Hershey, Pittsburgh and Scranton and two in Philadelphia — during the holidays. Pennsylvania has 13 nurse anesthetist programs, making it a leader nationally. Most of the programs are located in hospitals served by the six Ronald McDonald Houses. Nurse anesthetists work with patients of all ages as the hands-on providers of anesthesia care in hospital operating rooms, ambulatory surgical centers and other settings.